Global Footprint Network bridges science, policy, and economics to change how the world manages its natural resources and create a sustainable future. Updated every year, the National Footprint Accounts are now available for anyone to download on our Ecological Footprint Explorer open data platform at data.footprintnetwork.org. National Footprint Accounts (NFAs) provide the core data required for all Ecological Footprint analysis worldwide. The Accounts measure the ecological resource use and resource capacity of nations over time. Based on approximately 15,000 data points per country per year, the accounts calculate the Footprints of more than 200 countries, territories, and regions from 1961 to the present. The calculations in the National Footprint Accounts are based on United Nations or UN affiliated data sets, including those published by the Food and Agriculture Organization, United Nations Commodity Trade Statistics Database, and the UN Statistics Division, as well as the International Energy Agency. 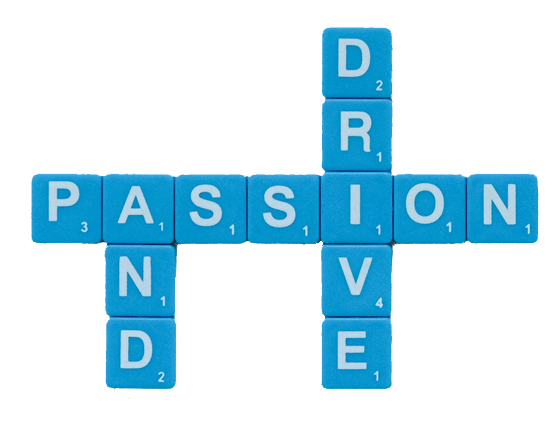 Supplementary data sources include studies in peer-reviewed science journals and thematic collections. Of the countries, territories, and regions analyzed in the National Footprint Accounts, 150 had populations over one million and typically have more complete and reliable data sets. For most of those, Global Footprint Network is able to provide time series of both Ecological Footprint and biocapacity. The Ecological Footprint is derived by tracking how much biologically productive area it takes to provide for all the competing demands of people. These demands include space for food growing, fiber production, timber regeneration, absorption of carbon dioxide emissions from fossil fuel burning, and accommodating built infrastructure. A country’s consumption is calculated by adding imports to and subtracting exports from its national production. 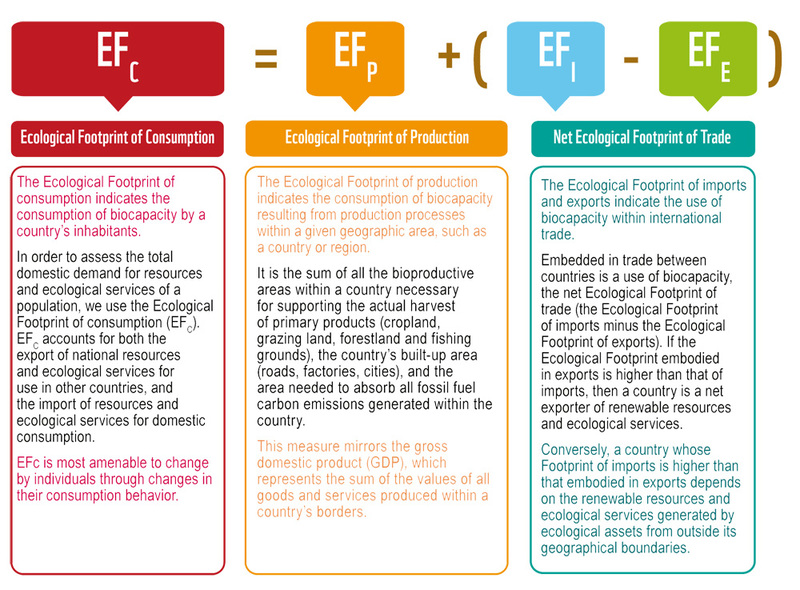 The Ecological Footprint uses yields of primary products (from cropland, forest, grazing land and fisheries) to calculate the area necessary to support a given activity. Biocapacity is measured by calculating the amount of biologically productive land and sea area available to provide the resources a population consumes and to absorb its wastes, given current technology and management practices. To make biocapacity comparable across space and time, areas are adjusted proportionally to their biological productivity. These adjusted areas are expressed in “global hectares”. Countries differ in the productivity of their ecosystems, and this is reflected in the accounts. 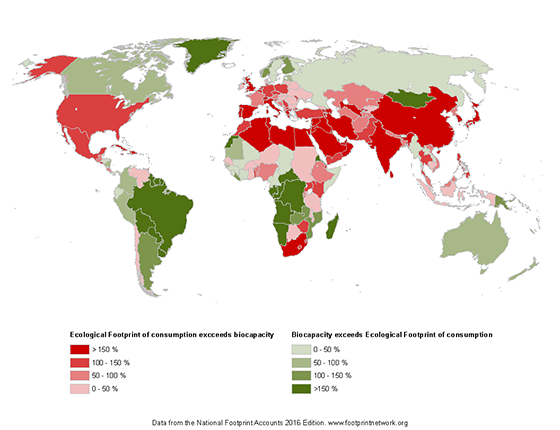 Results from this analysis shed light on a country’s ecological impact. A country has an ecological reserve if its Footprint is smaller than its biocapacity; otherwise it is operating with an ecological deficit. The former are often referred to as ecological creditors, and the latter ecological debtors. Today, most countries, and the world as a whole, are running ecological deficits. In fact, today over 85% of the world population lives in countries with an ecological deficit. The world’s ecological deficit is referred to as global ecological overshoot. The most recent description of the accounting methodology and results, based on the National Footprint Accounts edition 2018, was published in September 2018: Ecological Footprint Accounting for Countries: Updates and Results of the National Footprint Accounts, 2012–2018. This open access paper reviews the evolution of the National Footprint Accounts, describe and quantify the effects of data and methodological improvements that have been implemented into the accounts since the 2012 edition, and review the latest global trends. An older paper on the calculation methodology describes the National Footprint Accounts 2011 edition. The fundamentals are the same as for the 2018 edition. This paper explains the fundamental calculations and principles utilized in the of the National Footprint Accounts. It provides researchers and practitioners with information to deepen their understanding of the calculation methodology for the Ecological Footprint. It also includes calculation methodology for biocapacity, yield factors, equivalence factors, and the specific land use types included in the Ecological Footprint: cropland, grazing land, fishing ground, forest land, carbon uptake land, and built-up land. The calculation methodology for the National Footprint Accounts 2011 edition has been published in the Ecological Indicators Journal (Vol. 24: pages 518-533), and a final draft can be downloaded here. The actual implementation of the National Footprint Accounts through database-supported templates is described in the Guidebook to the National Footprint Accounts 2018 (2 MB). Note: The resources linked to this section describe the methodology for calculating the Ecological Footprint and biocapacity at the national level. Since comprehensive global data sets on production and trade generally only capture data at the national level, the National Footprint Accounts serve as the foundation for all sub-national, organizational and product Footprint analyses. The Ecological Footprint Standards 2009 are the current operational standards that we use with all of our partners and businesses, including the latest edition of the National Footprint Accounts. The 2009 Standards are also relevant for product and organizational Footprint assessments. The Ecological Footprint Standards 2009 are designed to ensure that Footprint assessments are produced consistently and according to community-proposed best practices. They aim to ensure that assessments are conducted and communicated in a way that is accurate and transparent, by providing standards and guidelines on such issues as use of source data, derivation of conversion factors, establishment of study boundaries, and communication of findings. The Standards are applicable to all Footprint studies, including sub-national populations, products, and organizations. The Standards have been developed through a consensus, committee-based process by a Standards Committee drawn from representatives of academia, government, NGOs, and consulting firms. As a Community Affiliate of the ISEAL Alliance, Global Footprint Network developed a standard-setting process following the steps of the ISEAL Standard-Setting Code of Ethics and Good Practice. 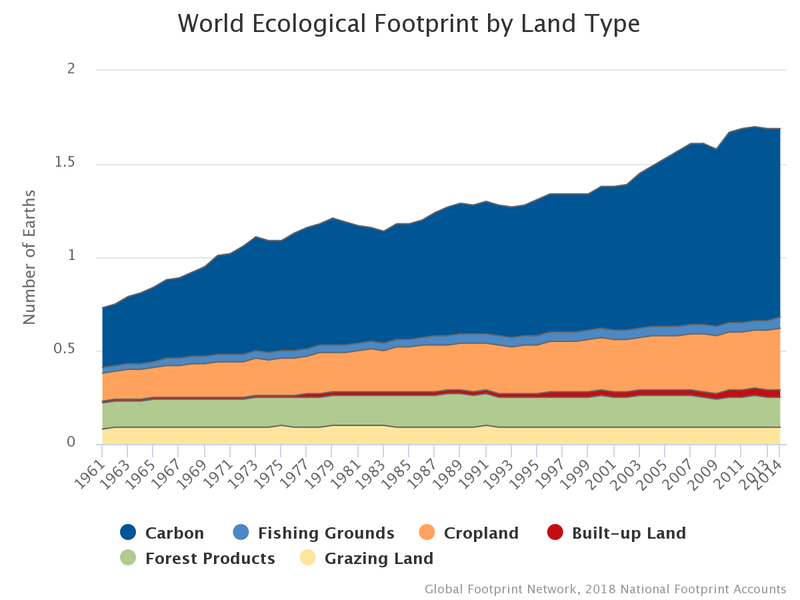 To promote the quality and integrity of Ecological Footprint Accounting, Global Footprint Network asks that all Partners comply with the most recent Ecological Footprint Standards. For more on standards, click here. Two committees, the Standards Committee and the National Accounts Committee, work with Global Footprint Network to oversee the scientific basis of the National Footprints Accounts and standards for Footprint applications. In addition, Global Footprint Network encourages national governments to conduct reviews of their country’s own accounts. Governments that have initiated reviews of the Footprint method and results include Switzerland, Japan, Germany, the United Kingdom, the European Commission, and the United Arab Emirates. Government, environmental, and business leaders around the world use our National Footprint Accounts data to better manage their country’s limited resources, reduce economic risk, and improve human well-being. Through our Ecological Footprint Explorer open data platform, we make this data available for free so that as many people as possible can use it to help create a more sustainable future. Today, more than 80 percent of the world’s population lives in countries that are running ecological deficits, using more resources than what their ecosystems can renew. Is your country operating in the red?